Dinner and a movie are main features of a couple’s classic date night. One Downtown San Diego venue offers a one-stop, new-and-greatly-improved version of that night-out experience for adults on the town. 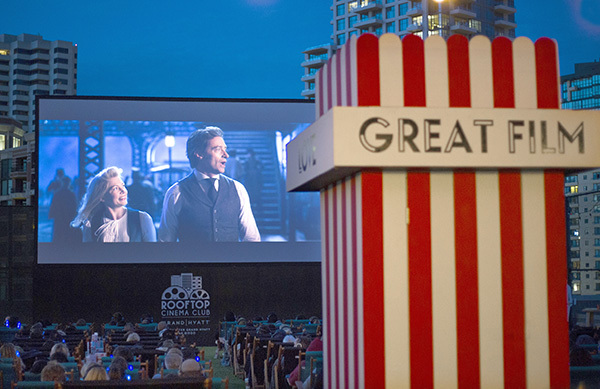 San Diego’s Rooftop Cinema Club invites moviegoers to evening dinners and screenings of film classics from the past several decades, in rotation with a few choice newly released movies. Located atop the fourth-story terrace of the Manchester Grand Hyatt San Diego at 1 Market Place, just beyond the hotel’s outdoor tennis courts, the scenic view before and during the showing is exceptional. Dinners and bar drinks are available after the rooftop box office opens at 6:30 p.m. on movie nights. Menu choices run the gamut of popular San Diego-style fare, including tacos, burritos and sandwiches. House-made potato chips as a side are an appetizingly delicious touch on dinner plates. Craft beers, wines and pre-mixed cocktails are options for adult beverages. Soft drinks are on the bar list, too. Pricing for food and drink menu items is surprisingly reasonable at the relatively isolated rooftop. Scattered sit-down tables are situated near the ticket office and food ordering station. Diners can also choose to find their theater seats and eat at other small tables placed among the theater seating rows. Ticket and snack prices are highly competitive with those for seats in multiplex theaters. One lounge seat cost $17 and adding bottomless popcorn refills increases a single ticket to $20. Lounge love seats are large enough for couples, for $24 apiece for each of two persons, including unlimited popcorn. The setting is beautiful, relaxed and comfortable, with movie show times starting roughly at sunset, shading into nighttime Downtown skyline stars and neon building outlines lighting the background behind the movie screen. Breezes from the nearby bay enhance the outdoor environment. Each attendee receives a headphone set with adjustable volume controls and on-off switches. The headphones effectively shield out Downtown background noise and audience chatter. Attendees can find a blanket near the theater front, if the evening air becomes chilly. Rooftop Cinema Club screenings, lovely as a summertime night out, will continue into the fall season in Downtown San Diego’s mild climate. September includes billings described as “cult classics, new releases and cinematic icons,” with film anniversary shows and other series. The oldest film on the upcoming schedule is the incomparable 1942 movie classic “Casablanca” on Sept. 26. The 20th anniversary honoring the release of “The Big Lebowski” follows on Sept. 27. A celebration of the 40th anniversary of the movie “Grease” will be on Sept. 15. “Women in Films” is another occasional series, with such offerings as a double-bill screening of “Mean Girls” (2004) and “Clueless” (1995) on Sept. 7, “Thelma & Louise” (1991) on Wednesday, Sept. 12, and another double bill of “Moulin Rouge!” (2001) and “Lady Bird” (2017) on Sept. 14. Recently released movies among Rooftop Cinema’s autumn screenings include “The Greatest Showman,” “Isle of Dogs,” “Black Panther,” and “A Quiet Place.” More information about the venue and movie schedules can be found online at bit.ly/2NgXxlj or by phoning 213-798-4409.